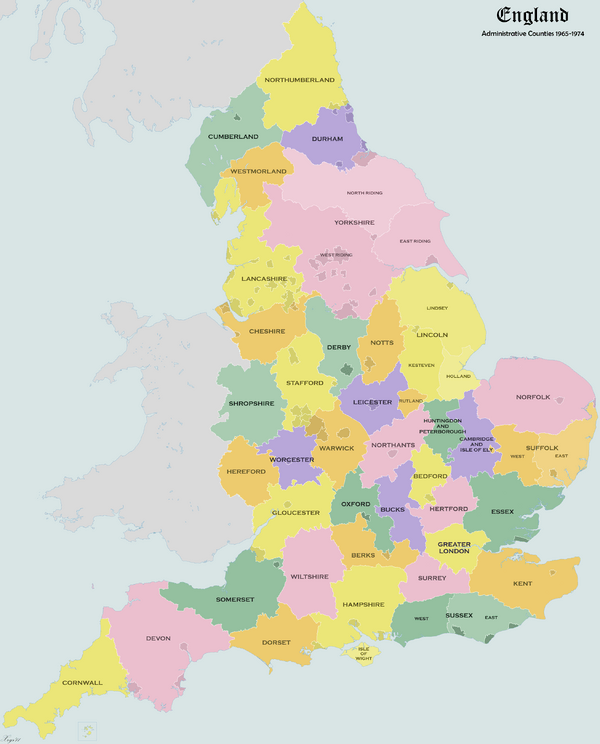 The administrative counties did not exist prior to 1889, see historic counties of England for the history of the English counties before then. 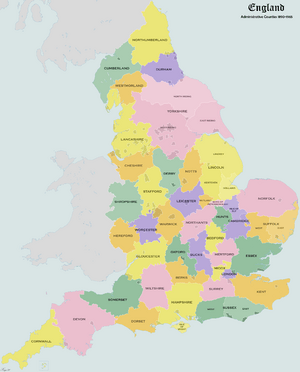 In 1888 the government, led by the Tory prime minister Lord Salisbury established county councils throughout England and Wales, covering areas known as administrative counties. Many larger towns and cities were given the status of county borough, with similar powers and independent of county council control. Under the Act, each county borough was an "administrative county of itself". In 1894 a uniform two-tier system was established outside the county boroughs and London, with subdivisions of the administrative counties called urban districts, rural districts and municipal boroughs. The structure was complete once the County of London was divided into metropolitan boroughs in 1900. Some exclaves had been left untouched by the 1844 Act, but in 1894 county councils were given the power to adjust county boundaries, and most anomalies were removed in the next few years. For example, the Measham area of Derbyshire was transferred to Leicestershire in 1897. The map shows the counties and the county boroughs. When a county borough expanded into territory of a county that was not the one it came from, maps sometimes showed this as an increase in size of the county the county borough was associated with. Monmouthshire, not shown on the map, was reckoned for some legal purposes among the English counties for most of this period. The 1888 Act did not contain a list of administrative counties: it was not until 1933 and the passing of a new Local Government Act that they were enumerated in the Act's schedule. Unlike the 1888 Act, the 1933 Act did not include county boroughs as administrative counties. In legislation and formal documents the suffix "shire" was generally not used: for example, Bedfordshire was referred to as "the administrative county of Bedford" and the Northamptonshire council as the "county council of Northampton". In the case of Lancashire and Cheshire the councils were officially the "county council of the palatine county". Shropshire was always officially entitled the "county of Salop". The right of Berkshire to be described as a "royal county" was recognised by the monarch in 1958. On 1 April 1959 the administrative county of Southampton was renamed as Hampshire. This system was the basis of the ceremonial counties used for Lieutenancy – except that Cambridgeshire, Hampshire, Lincolnshire, Northamptonshire, Suffolk and Sussex were not split for Lieutenancy. (Yorkshire, however, was). The table lists the area and population of each administrative county at the censuses of 1891 and 1961. Several county councils had administrative headquarters outside of their area. This was usually because the traditional county town was a county borough. The headquarters of Derbyshire, Leicestershire and Nottinghamshire county councils were moved from the county boroughs to locations within their respective administrative counties. Chester Castle, in which County Hall is situated, was a civil parish and exclave of the Chester Rural District and thus an exclave of the administrative county and an enclave in the county borough. The boundaries of the administrative counties changed considerably over time. The reasons for this were threefold: the growth of towns on either side of an existing boundary, the creation and extension of county boroughs and the elimination of outlying exclaves and other anomalies. As urbanisation increased, and suburbs were built on a scale not seen before, the urban areas surrounding various towns and cities started to cross traditional county borders. The Local Government Act 1888 provided that in the case that an urban sanitary district crossed a county border, the entire district would be considered part of the county in which the larger part was. This condition was maintained with the expansion of urban districts and municipal boroughs. Towns that were split by historic borders and were unified in one administrative county include Banbury, Mossley, Tamworth, Todmorden. Additionally, the territory and population of administrative counties was reduced by the increasing numbers of county boroughs, and extensions thereof. This was recognised as a problem, and the process of creation and enlargement of such boroughs was made more difficult by the Local Government (County Boroughs and Adjustments) Act 1926. By June 1970 25% of the population were within the county boroughs. On creation, many of the administrative counties had a number of exclaves. During the 1890s most of these were eliminated, with parishes being exchanged between counties. The boundaries of Gloucestershire, Worcestershire and Wiltshire contained numerous enclaves and exclaves, and were realigned in 1931. The County of London was abolished, and replaced by Greater London, a sui generis council area, taking the three of the surrounding county boroughs, more of Surrey and Kent, parts of Essex and Hertfordshire and consuming nearly all of Middlesex – the remaining parts being ceded to Surrey and Hertfordshire. Some other changes took place, such as the Soke of Peterborough and Huntingdonshire being merged into Huntingdon and Peterborough, and the merger of the original Cambridgeshire with the Isle of Ely to form Cambridgeshire and Isle of Ely. The map shows the counties and county boroughs just prior to their abolition in 1974. Administrative counties of England Facts for Kids. Kiddle Encyclopedia.